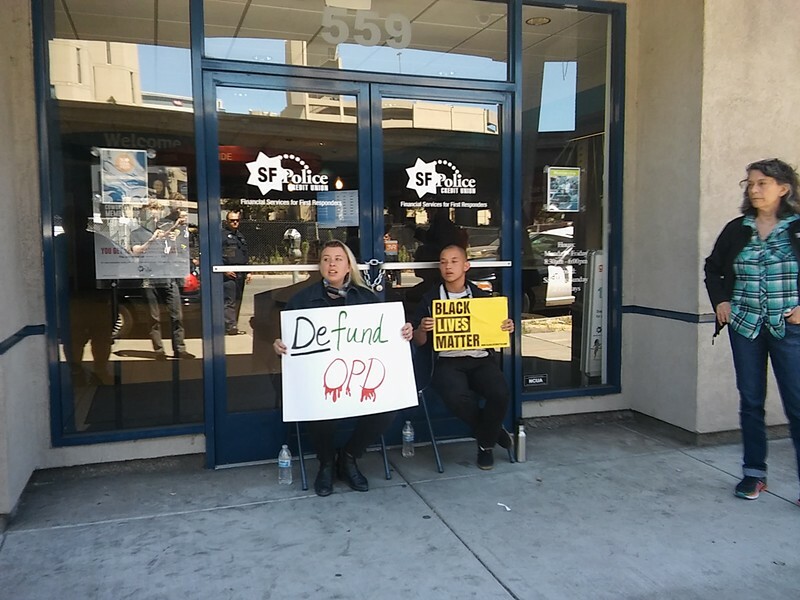 Protesters locked themselves to the doors of the Oakland police union building. 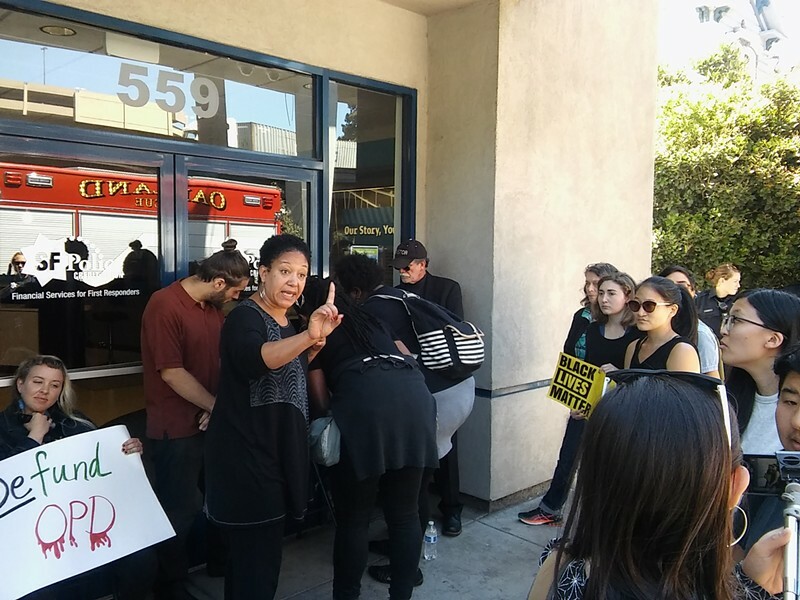 Calling on the City of Oakland to "divest" from its police department and invest public funds in schools, housing, and job training, about two dozen protesters blockaded the Oakland Police Officers Association union hall today. Several locked their necks to the building's doors. The protesters succeeded in closing the OPOA's headquarters while officers stood nearby watching. Oakland police Officer Johnna Watson told the Express that officers on scene would "facilitate" the protest and wait. She said there was no intention of trying to remove the protesters by force. The direct action at OPOA's building coincides with similar disruptions at police union headquarters in New York and Washington D.C. today. Oakland's Black population was hit hard by the foreclosure crisis, and Black residents are much more likely to suffer unemployment, homelessness, and serious health problems. A recent study conducted by Stanford University researchers found that OPD officers disproportionately stop, search, and handcuff Black people. Earlier this year the Oakland City Council established a Department of Race and Equity in an effort to reduce racial disparities in city services. This year the city council budgeted $242 million for the police department, or about 20 percent of the city's total available funds. By comparison, Oakland's libraries received $30 million and the city invested $17 million in economic and workforce development. 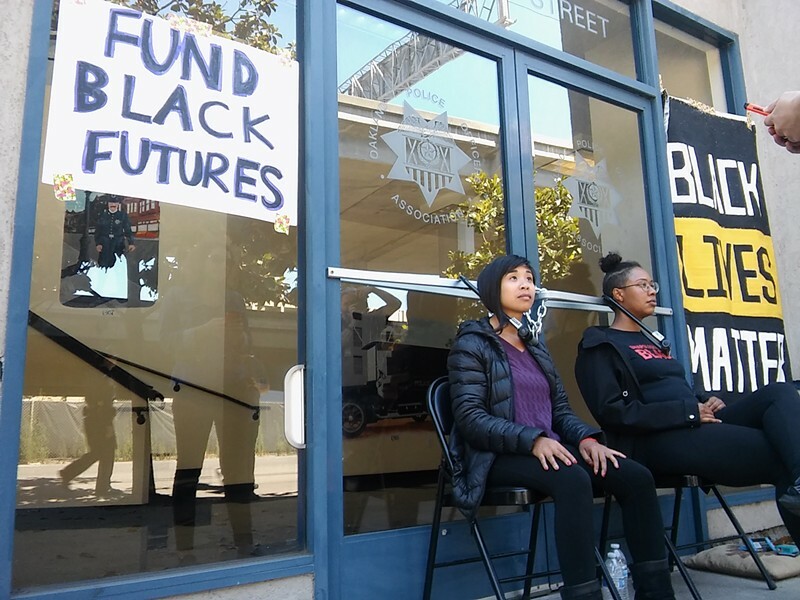 Oakland's new Department of Race and Equity has a budget of just $312,566. 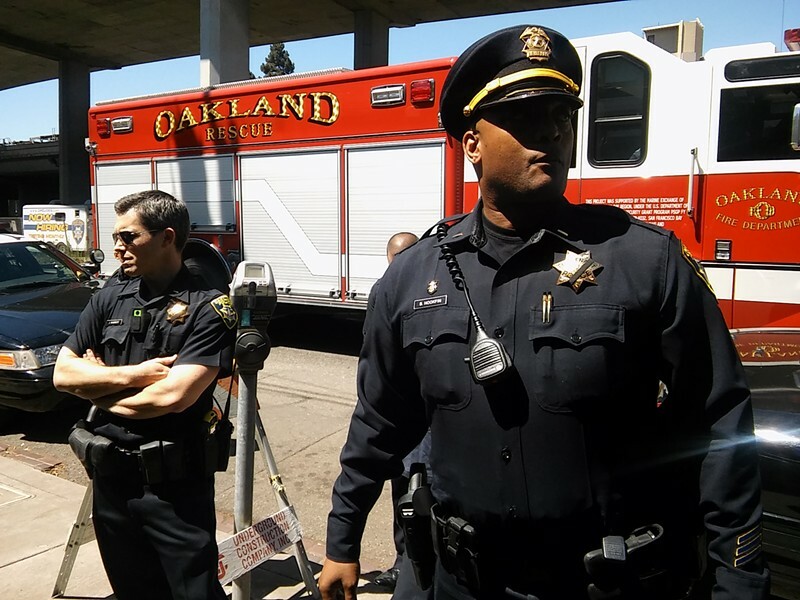 Last month Oakland's mayor and city council approved another $5.4 million in police spending as part of the city's mid-cycle budget amendments. The increased spending included $1.18 million for a police academy to begin after May 2017, and $1 million set-aside to fund a police proposed commission. 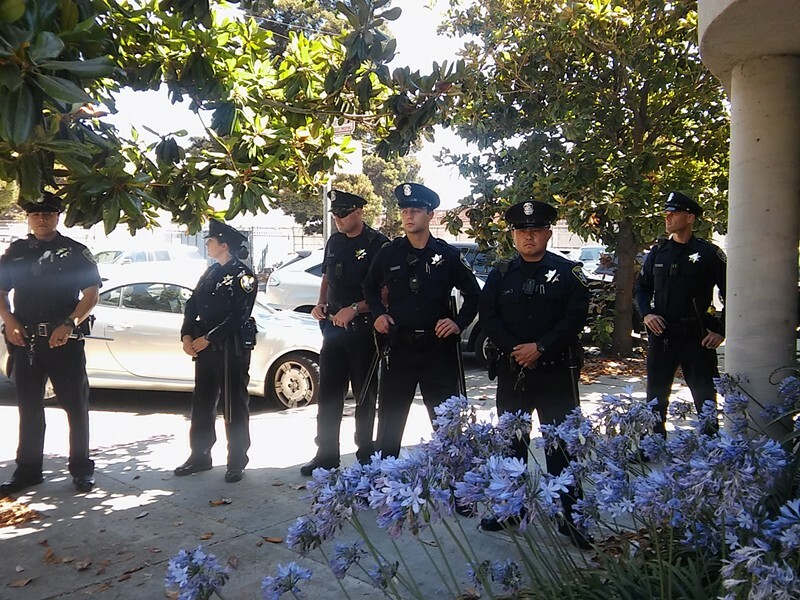 Oakland cops wait patiently in the shade during a protest at their union hall today. Cat Brooks of the Anti-Police Terror Project tells officers and firefighters not to attempt to remove a protester whose neck was locked to the building's door. Oakland police Lieutenant Bobby Hookfin supervising officers who responded to the protest.